PETER MARCY (ATTACK OF THE TATTIE-BOGLE): "MidWest WeirdFest was unforgettable. Dean Bertram was a pleasure to meet and a champion of our movie. Leading up to the fest, he maximized anticipation and got us a 25-minute podcast interview, two reviews by critics, a newspaper article, and tons of social media exposure. The fest itself was great. The venue had an old theater charm that I thought had been lost forever. The crowd was warm and enthusiastic and gave some whoops and applause when the end credits rolled. We had a lively Q&A afterward that I didn’t want to end. And downtown Eau Claire was delightful with numerous restaurants and coffee shops within blocks of the theater. I loved my experience and hope to return." Nicholas Costa (NEIL STRYKER AND THE TYRANT OF TIME): "I can't believe this was the first year of this festival. 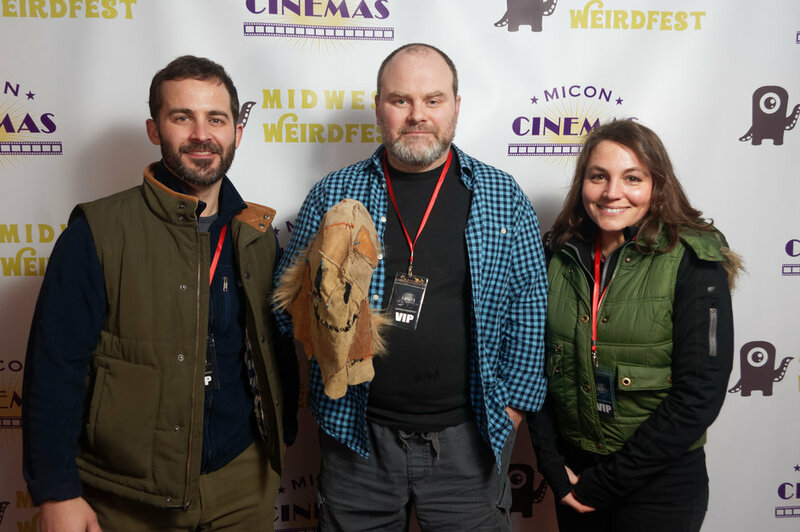 Midwest WeirdFest was run like a fest celebrating its 30th anniversary. No surprise as Dean Bertram is master & commander of the biggest genre fest in Australia; not just anybody gets to go around saying that they run the best ANYTHING for an entire continent, folks. And Dean Bertram shows you why he hosts one of the premiere genre fests in the world as he dedicates himself to promoting your film even after the fest has run, and, all the while making you feel like you're one of the family. We had our rust belt premiere of Neil Stryker and the Tyrant of Time in March 2017, having previously screened at A Night of Horror and Fantastic Planet Film Festival in Sydney, Australia in November 2016. The Wisconsin premiere was a huge success. Dean connected us with some great press and even helped churn out some of the best podcasts we've heard promoting our film. Who knew Eau Claire, Wisconsin, would be such a wonderful hub for indie film? You will not be disappointed." Dan Schneidkraut (VORE KING): "Outstanding festival. Great venue. And it's really refreshing to see interesting films that aren't in every other film festival and shorts that aren't just the same old cute punchline based crime/zombie b*******. Very well programmed. I really hope to have the opportunity to attend again in the future ... MidWest WeirdFest was beautifully organized and extremely enjoyable from start to finish. We had a lovely time. Anyone making strange/challenging/revolutionary work should definitely submit their projects." Paul Von Stoetzel (IN THE KITCHEN WITH...) "I have been screening at film festivals for over a decade and I've never had such an incredible experience at a fest much less an inaugural year at a festival. The staff was great, accommodating and wonderful to work with as well as the fact that the shorts selection my film was screening with was one of if not the strongest selection of shorts I've ever been programmed with. I cannot recommend MidWest WeirdFest enough. I'm already planning on submitting for next year and I hope to screen and attend there again." Michael J. Widger (OFFICER PIGSLEY) " The Midwest Weirdfest is a great outlet for dark, twisted, fun films. There were so many talented people there! Dean Bertram really knows how to wrangle a bunch of crazy filmmakers together, and get them talking. It was refreshing to see so many great films that were focused on being fun and imaginative! We almost forgot that there are other weirdos out there that appreciate weird movies like ours." Stewart Koski (THE PEPIE LEGEND): " Highly recommended!" Danny Villanueva Jr. (DON'T CRY, PAPA): "Midwest WeirdFest was an absolute blast! My short film, 'Don't Cry, Papa' screened at the inaugural fest and I couldn't have been more pleased. Dean Bertram was a very friendly and professional director who showed great hospitality. The fest was held in an actual cinema which was a huge plus. His selection of films was of high quality and definitely all spoke weirdness. I met some very cool and interesting fellow filmmakers and audience members which was a great experience. I highly recommend submitting and attending to anyone interested in a very enjoyable genre festival!" (Left to right) Danny Villanaueva Jr., Maddie Holliday Von Stark, and Dan Schneidkraut at MidWest WeirdFest 2017. Zachary Lona (WE CAME TO WRECK EVERYTHING): "I never expected our film to be conventionally programmable, so the moment I saw MidWest WeirdFest I knew it might have a home in this utterly mind-bending ride of a festival. Dr. Dean Bertram and the gang have a concise vision for screening only the best of genre and underground cinema. And amidst the chaos is the camaraderie and hospitality that's integral to the midwest as much as its oddities. It was an honor to be a part of the inaugural year, and here's to many more." Seth Breedlove (BOGGY CREEK MONSTER): "Wonderful festival. A lot of effort, care and thought went into it. Great promotion of our film as well. Highly recommended." Benjamin Capps (IT GROWS DARK) My time at MidWest WeirdFest 2017 was a singular delight, beginning from the time that organizers Dean Bertram and Maddie Holiday Von Stark picked me up at the airport. When our conversation quickly evolved to a discussion about the 1950s UFO contactees, I knew I was in for a magical weekend. I saw such a breadth of great work and met several filmmakers whose visions have continued to inspire me. All of the film selections were uniquely different, and my only regret was that I had to return to Chicago before the final day of screenings. Finally, I was bestowed with the award for Best Animation for the stop-motion sequence of It Grows Dark, an unexpected and humbling accolade which has me all the more motivated about my new Sci-Fi project, CIVET. Eau Claire and the Micon Cinema were beautiful settings for the inauguration of a deliciously-eclectic film festival of which I again hope to be part!"